Isn't it time recruiters had the same powerful email tools as salespeople? We’re excited to announce the launch of Entelo Track, our latest feature equipping recruiters with the ability to send, schedule, and monitor candidate emails all within our powerful sourcing platform. 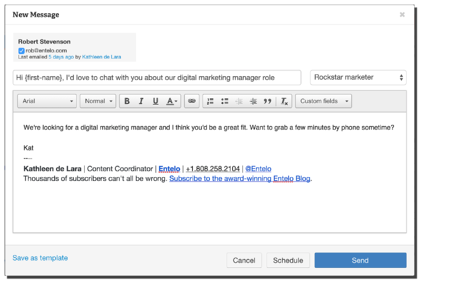 With this latest addition, Entelo users will be able to customize outreach, know when candidates are interacting with their emails, and learn optimal times and messaging styles to connect and engage talent. With Entelo Track, why stop at sourcing? Find talent, engage them with your opportunities, and track the way your team interacts with candidates. Entelo Track makes it easy for anyone on your team to contact and monitor outreach with talent at any stage of the hiring funnel, from the first message to the offer. Improve the way you connect with potential hires with hyper-personalized emails powered by messaging templates, customizable text, and scheduled sending that works for you and candidates. Take control of the way you connect with talent and start making more hires! Want to take Entelo Track for a full spin? Sign up for a demo – we’d be happy to show you first-hand how Entelo can help find and engage qualified candidates for your team.